For the opening of his art show last night, Stacy printed a short run of books with plates of all the paintings and a short essay by James Frey, co-owner of the Half Gallery. 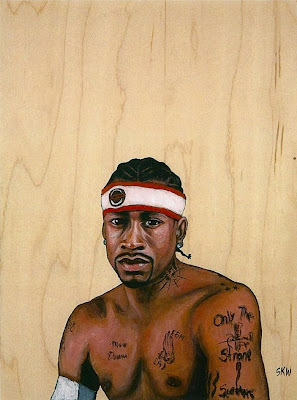 My favorite painting is this one of Allen Iverson. He has a few books left and is offering them for a $50 donation to a cool nonprofit called Harlem Children's Zone. Contact rubina@imperial.tv.